Renaissance is a program that encourages academic excellence, school improvement, and citizenship. Our school also focuses on school beautification and building community among students and staff. If you would like to know more about the program, download our brochure. We would like to say Thank You to all of the local businesses and the Everett Area School District Employees that have contributed to the Renaissance Foundation for the 2014-2015 school year and look forward to an exciting year of "polishing the stars" in 2015-2016. M&T Charitable Foundation made a $500 contribution to the Everett Area Renaissance Foundation, Inc on behalf of M&T Bank. Jackie Cessna, M & T Everett branch manager presented the donation to Jim Mearkle, chair person for the Everett Area Renaissance Foundations, Inc. This donation will help to complete many of the projects throughout the district during the coming year! Thank you to all of the employees of our local M&T Bank office!!! Please visit Jostens Renaissance website for more information. A big thank you to M&T Bank and Bedford Ford for donating to the Everett Renaissance! Together they donated $5,259. Part of the donation was raised by the Drive 4 UR School event and was donated from Ford Motor Co. and Bedford Ford. Further information can be found on the Bedford Ford Lincoln Facebook page. 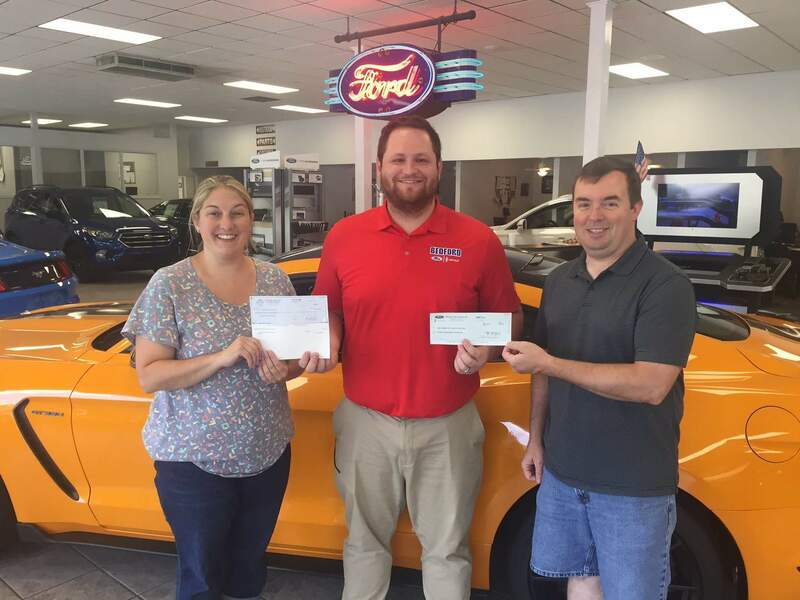 Below is Nikki Spade from M&T Bank presenting the donation to Jim Mearkle, and Cole Barkman from Bedford Ford presenting the donation to Jim Mearkle and Allison Fredrick. Thank you M&T Bank and Bedford Ford for your continued support! Do you want to know more about the Everett Community?